More interesting (to me) than Delta’s $794 million first quarter loss is the new bag fee they’re putting in place on July 1. We’re all used to bag charges by now, either because we’ve paid for them at the airport or at the very least have heard the media talking about them nonstop, but Delta’s leading the pack on this one. They’ll actually be charging $50 for a second checked bag on international flights. I have mixed feelings about this. On one hand I sort of like the “unbundling” that’s happening in the industry. It makes sense to me, at least when it comes to bag fees. Passengers that consistently don’t check bags are essentially subsidizing the handling and added fuel costs of those that do check bags. On the other hand, fees like that are easy in the US when almost every carrier matches. The problem here is that Delta is competing with international airlines that don’t nickel-and-dime customers. Not only do most international airlines not charge for bags, but they don’t charge for alcohol, headsets, etc. Only time will tell whether or not this new fee will stick. It will ultimately come down to whether or not the other US legacies match. I certainly will not be flying on Delta for international flights. I try to fly JetBlue for domestic when possible b/c of their lower fees. I’d fly Southwest, but they don’t go my route. It’s the principal of the matter. I’m sure I’m not alone in hating bag fees — not because I pay them, but because I always carry on, and the availability of overhead storage is quickly heading toward zero as more and more people squeeze the maximum size bags into the overhead. The problem came to a particularly annoying head last month when my wife and I were flying AA, both with carryons, and they ran out of overhead space before we could get our bags stowed. The FA insisted on checking one of our bags — we weren’t even given the opportunity to take the DSLR camera out of it (hey, we weren’t planning on checking it!). Needless to say, the bag was subsequently lost, and we were without half our stuff for 3 of the 4 days we were gone (and a significant portion of our trip was spent helping AA track down and deliver the bag). So when I read stories like this, I get a little nervous, even though I know that international aircraft usually have much more overhead space. 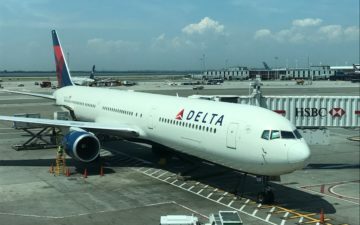 All that being said, Delta is destined to fail here, as you said, unless other airlines continue their race toward the bottom and match this ridiculous policy. i like it, more value for being elites, besides i don’t even remember the last time i checked luggage, i’ve got everything i need in my back pack, and i don’t see why i pay the same price as someone with 100 pounds of luggage. If airlines are looking for some extra revenue, i suggest combining the bag fees with UA’s fat pax policy. Set a total weight allowance for the passenger and luggage (essentially everything brought on the plane) and then charge the extras. @Sam — how do you figure you paid the same price as that person with 100 lbs of luggage? Given the constantly changing airfares and the different fare classes, there aren’t too many people on a given flight that paid the same price for their ticket. As I very, very rarely check more than one bag (if any) I don’t particularly care about this fee increase. I was surprised to read today that BA has had a fee for second checked bags on some overseas flights that has been in effect for quite some time. @ Oliver, ok? but i would be just as likely to pay more than a person with 100 lbs of luggage, so on average controling all other factors, we’d pay the same per flight. The thing is airlines are losing money, and they have to gain revenue somehow, so its a choice between a fare increase across the board or this. So in the end, its a choice between everyone paying $30 more for their flight, or someone with an extra bag pays $50 more, the second choice seems a bit more fair to me. Pretty hard on families, potentially, as well as business travelers with presentations, samples, etc. The question is whether or not the other SkyTeam carriers have followed suit. If they haven’t, this may go away as quickly as United wanting to charge for international meals. Either way Delta hasn’t been worth my money for longer than I care to remember.